"When I opened my eyes, I couldn't find my baby beside me, I begged the nurse to show my newborn. Her sad expression told me that something was not right. I asked her if the baby was alive and she told that I was gifted with a son but he is in the NICU. 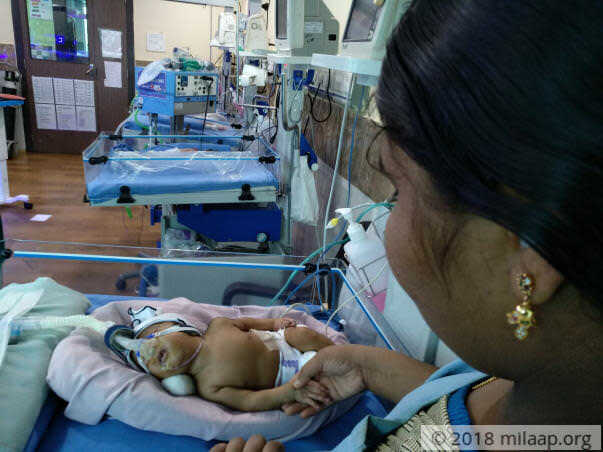 I thought as he was a premature baby he just needed medical assistance, but the reality was he was fighting for life from the moment he came into this world," - Baby's mother, Kalaprabha. This 2-month-old baby was born in the 7th month of the pregnancy. He is now suffering from a breathing disorder caused by immature lungs and also a disease that blocks airflow which is making it difficult to breathe. "On the 11th day, I was able to travel and see my son. His tiny body was on ventilator support. I couldn't even see him properly as his little face was covered with tubes. 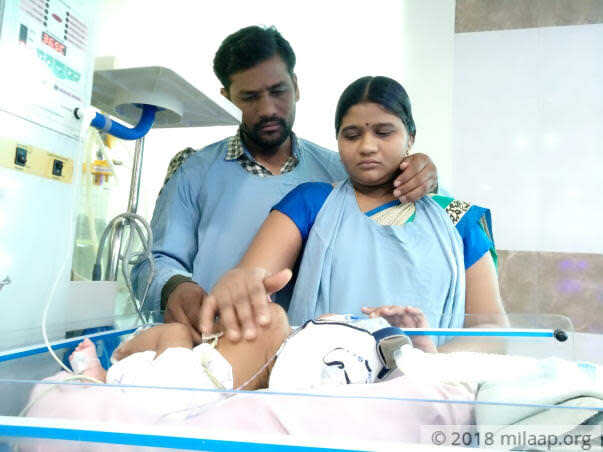 My husband and I thought he just needs to stay in NICU for a while, but when they told us that he has a breathing problem, I couldn't handle myself," - Kalaprabha. While he was suffering from the breathing problem, he developed another disease, Severe Gastroesophageal Reflux, where the food comes back to the food pipe from the stomach. This has made his condition more critical and put this 2-month-old baby's life in danger. "He used to vomit frequently, and suddenly he stopped throwing up so we assumed everything was fine. But a few days ago they told us that he is not vomiting because the food is going to another part of the body. We were lost when we heard that, we didn't even know such a thing was possible. All that we knew was to hurry his surgery to save our baby," - Kalaprabha. 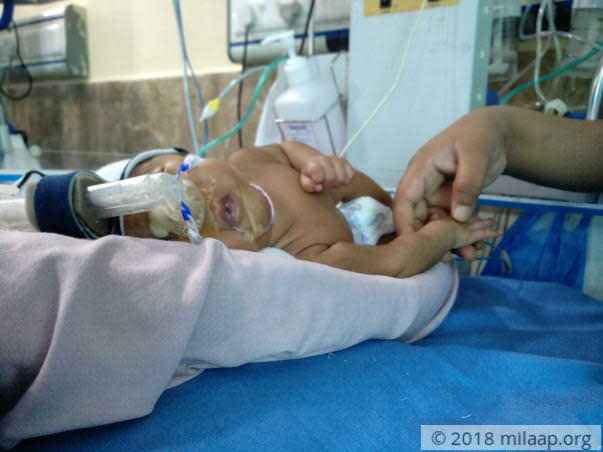 This 2-month-old baby should undergo a couple of surgeries immediately to be able to breathe normally and also to stop the reflex of the food in the food pipe. Only these surgeries can help him survive his battle for life. 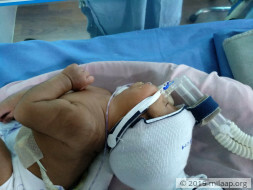 After the treatment, he should be admitted to the NICU for at least 2 weeks. "He turns his tiny head backwards whenever he is in pain, at times he cries out so loudly that he suddenly stops to gasp for air. I haven't fed him properly until now. He is being fed only through tubes. As a mother I feel horrible to see him go through all this," - Kalaprabha. Ananth works in a cement factory who only earns Rs 400 a day. He is unable to bear the expenses of the hospital anymore with his little income. He has already spent 8 lakhs in two months which is 33 times more than what he can earn. Now he is left penniless and inadequate to pay for the treatment that can save his son. "A day in a NICU costs Rs 15,000, we have invested every rupee we had in his treatment for 60 days. We have exhausted all our earnings. My husband begged every person he knows and could not even collect a rupee. Now crowdfunding is the only option left for us. Please help our son live"- Kalaprabha. This 2-months-old baby is struggling to take a breath and the food is not going to stomach instead it is staying in food pipe. 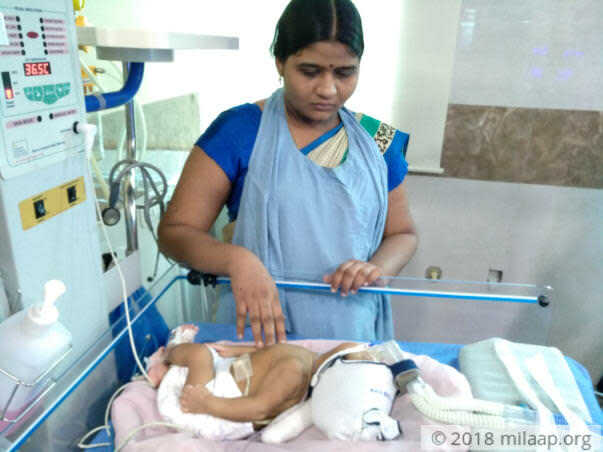 This baby needs to undergo a couple of surgeries urgently which costs 6 lakhs. Without the treatment this family may lose their little baby. Thank you for all the support. Currently the baby has recovered well and is on normal feeds now. We will keep you posted on the progress. 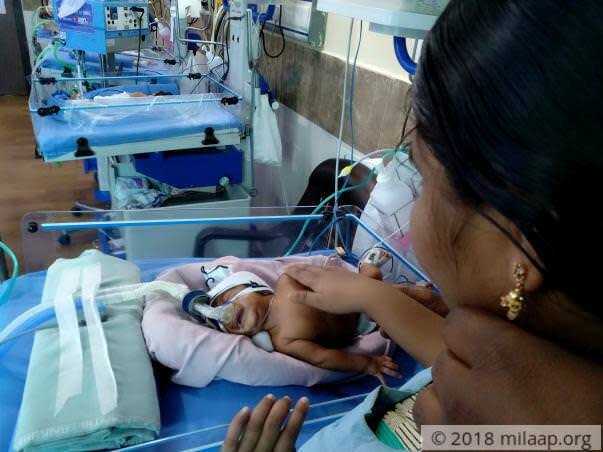 Baby of kalaprabha had the initial surgery on epiglottis followed by gastrostomy and baby is currently on tube feeds and showing an increase in the body weight.baby is expected to be discharged in 20 days. 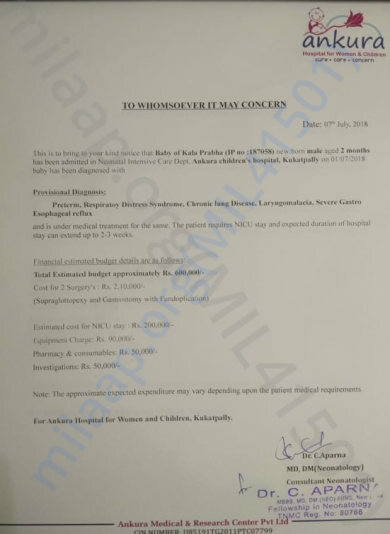 The parents have found alternate means to fund the treatment of the baby hence we are stopping the campaign. All the funds raised from this campaign will be utilised towards the treatment of the baby so far.